I talk today with Glenn Chickering, a founding faculty and head of upper school at the Green School. We enjoy a variety of topics including the power of experiential learning, giving students freedom to pursue passions and how having a positive impact on the local community brings learning to life. Glenn uses the term “messy learning” to explain their pedagogy and you will enjoy understanding what that means. 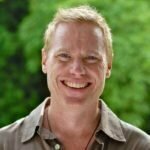 As a founding faculty member of the Green School, Bali combined with experience in a variety of educational organizations, Glenn gained perspectives on the needs of the student, teacher, and parent from many different vantage points. This helped him to better understand the interconnections of all stakeholders and how best to steer relationships to foster a sustainable organization.